Lead and Gold is a multiplayer-only Western-themed third person shooter available via the Playstation Network. Released two weeks before Red Dead Redemption, L&G was created in order to ride RDR’s coattails. Since the game is only playable via online multiplayer, it is an absolute necessity for it to have a thriving community. Unfortunately, that it is not the case here, and that makes for an underwhelming experience. 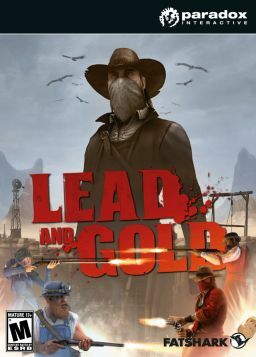 Lead and Gold comes across as a mix between Red Dead Redemption gunfights and Team Fortress 2. This is very much a bare-bones online shooter. You select from one of four character types (i.e. close range specialist, sniper, etc) and then play one of six different game modes (essentially a mix of capture-the-flag games and deathmatches). The core gameplay is decent enough — the shooting mechanics are solid, and the maps are well-designed — but the main problems lie within the online experience itself. First, the community is on its last legs. There really aren’t that many people that play this anymore, and I suspect that number will go down drastically once it is removed from the free Playstation Plus downloads. Second, when you are actually lucky enough to find a full game, there is a fairly good chance you will run into some kind of connection issue and get booted from that session. As mentioned earlier, for a game that is only playable online, the internet connectivity needs to be a strength with little to no problems. Throw these connection issues in with the fact that the majority of players have no clue what they are doing, and that gaining XP is worthless (your progress is not tracked from game to game) and you have one utterly pointless experience. Lead and Gold might have been worthy of producing good times when it first came out, but those days are long gone. For some reason, this is still $14.99 on the Playstation Network, and that is just an insane price to pay for something that is devoid of content. If you are jonesing for a Western-themed shoot ’em up, just pay the extra $$$ for Red Dead Redemption. Don’t waste your money with this one.